The landslide hazard is one of the major natural disasters in Thailand that has caused tremendous loss of lives and properties. Public awareness was significantly arisen when the severe flooding and landslide occurred in Kathun district, Nakhon Sithammarat Province, southern Thailand in 1988 where the worst hit was approximately 230 casualties in Ban Kathun Nua. Subsequent devastated landslides occurred in Ban Nam Kor and Ban Nam Chun areas in Petchabun Province. 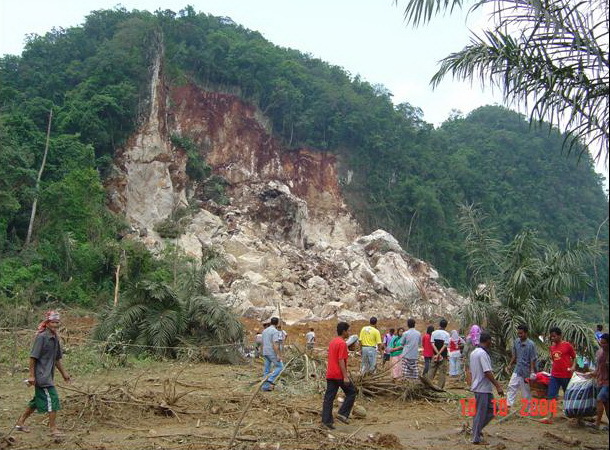 In Year 2006, there have been two major landslide events in Uttaradit and in Nan Provinces, northern Thailand in May and August respectively. A nationwide landslide hazard study and mapping project has been studied to determine landslide potential and affected areas, mitigation plan all over the country. § The communities in the landslide vulnerable areas are aware that they have to rely on themselves first. Expensive high-tech equipment cannot assure their safety from the disaster. It was them to get prepared and fully alert. Also, self reliance does not mean each people stands alone but has to work together. § DMR has to work with the community in planning for disaster prevention system � what system will it be, how we can set the volunteers to take turns in watching the disaster signal (e.g., stream water level), how the signal can be sent to the others, how can we evacuate people when the disaster occurs. § Establishment of geohazard warning network needs close cooperation between the community and relevant government officials who are responsible in disseminating the information, rescue lives, educating the communities as well as preparing for the disaster. (1) 30 September 2003 approved the DMR, Ministry of Natural Resources and Environment�s proposal in establishment of landslide warning networks in 51 provinces all over the country and prepare the risk maps. (2) 25 May 2004 assigned the DMR to testify and establish the landslide warning network to cover all the risk areas in the country. During July 2005 � September 2007, landslide warning network missions were carried out in 26 Provinces in the South, North and Eastern Thailand. The following outputs are landslide vulnerability maps, landslide risk village maps, geohazards awareness and warning cooperation plans in 106 Amphoe, training and establishment of geohazards warning networks in 1044 villages. To date, there are risked communities in 51 provinces from the total 76 provinces of Thailand. The DMR has accomplished about 50% and expected to get all done in 2010. As the result of 26th December 2004 tsunami, people have tremendously loss their lives and properties. Subsequent geological phenomena have occurred and threatened people such as sinkhole collapses, frequent earthquakes, the DMR therefore expanded the project on the landslide warning network to cover all kind of geohazards.